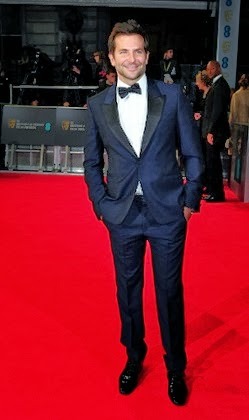 Plush Styles: BAFTA AWARDS 2014: Our Most Stylish Pick. BAFTA AWARDS 2014: Our Most Stylish Pick. The much anticipated Baftas has come and gone and as usual the stars came out in their electrifying outfits and styles, some got it right and some got it wrong. Am not going to do a merry go round about who wore it best and who didn't as every fashion website or blog in the world will be on that today. We'll just pick the best of the lot (Female and male) and tell you why they looked so good on the night. Lupita Nyong'o once again stole the red carpet. She came out in a bold green, clean strapless dress. Everything just fell into place. Her short hair, the colour of the dress which was perfect against her skin and the carpet and the way her bracelets echoed her belt. A perfect accessory for a green outfit is always gold and that's the only accessory that could improve that dress. She was flawless again. Bradley Cooper may have made the headlines for a different reason on the night but on the red carpet, he was the most stunning man. Looking dapper in a navy Alexander McQueen suit with black lapels and a black bow tie, brilliant smile and a perfect beard and hair cut. The best feature about any man in a suit is the fitting! And on the night, Bradley got this totally spot on unlike most of the men on the night (Tinie Tempah included) who either got it a little undersized or oversized (and let's not even go on about Christian Bale). Lupita Nyong'o and Bradley Cooper are the two best dressed for the Bafta Awards night. Here's a few other stylish outfits on the night that also looked great. Uma Thurman kept it simple and classy. A simple diamond necklace to compliment a perfectly fitted black dress. She just oozed of class. Brad and Angelina brought something different on the night to the red carpet. They both rocked matching outfits reminiscent of Posh and Becks. They had this cheekiness about their style almost like they had been up to something naughty just stepping out on the red carpet. Oprah! For a woman her size she sure knows how to carry herself and bring out the best out of her body features. 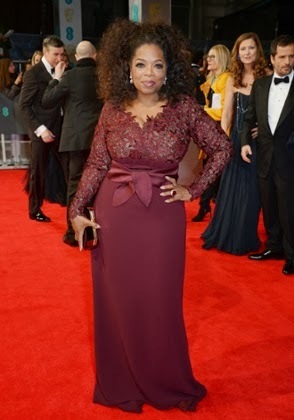 The dress emphasised her busts which is one of her main assets and the colour she chose blends well with her skin. She looked HOT!